Whether your need is for continuous or batch process, small or large load, long or short cycle, fixed or variable process, electric or fuel-fired, Wellman Furnaces has the expertise to engineer, design and build it. Our record proves it. 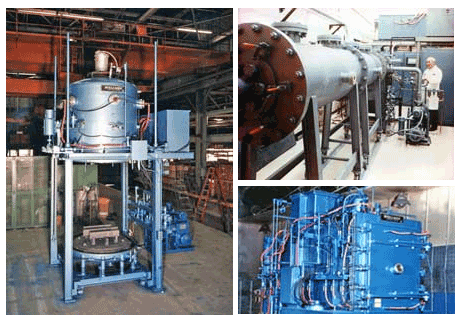 We have provided custom heat processing solutions for tough applications all over the world. Electrically heated Pit Furnace for heat treating gun tubes for M1A1 Tanks. Performance tests to verify heating rates and uniformity were performed at Wellman Furnaces' factory prior to shipment. Electrically heated Chain Conveyor Furnace with controlled atmosphere. This 143 foot long furnace has eight parallel alloy load chains and operates st 1200˚F. Electrically heated high temperature Pusher Sintering Furnace for processing nuclear fuel material. This furnace has molybdenum heating elements for operation in a hydrogen atmosphere at 3272˚F. Elevator Type Vacuum furnace (left) operates at 3500˚F. for processing carbon/carbon composite aerospace components. Horizontal Chamber Vacuum Furnace (upper right) operates at temperatures up to 3992˚F to test components used in the international space station. Integral Oil Quench Vacuum Furnace (lower right) was installed at a US national laboratory and is designed for 2400˚F.